When booking is online the available plots will be shown on the online booking form. In order for booking to be confirmed, all Exhibitors will need to provide a Risk Assessment. Please download the Exhibitor Risk Assessment Guidance Notes and Risk Assessment Proforma. Some Exhibitors may also need to complete a TDS check sheet if erecting marquees. Please note: This Guidance is subject to change, so please make sure your refer to the latest version. Please note: Event plots go by the hour so the site map above may not reflect the most current availability. Plots shown as available may already be in the online booking process. Plots are only shown as unavailable once payment and full confirmation has been made on the online booking system. Wide range of plot options – sizes, locations and prices. Up to 8,500 visitors and buyers expected. 2016 ARB Show Exhibitor Survey showed over £1.2m (estimated) taken in orders over the Show’s duration. Quarter 2 (2016) page views for ARB Show page 16,892. Free listing for all Exhibitors and further promotional opportunities! The dedicated ARB Show app will available for visitors to download up to 6 weeks before the show. The App provides an enhanced experience enabling visitors quick access to exhibitor information and deals. All Exhibitors will get a free listing in the App, which will be available for free through iTunes and the Google Play store and will give your brand a more prominent reach before, during and after the event. Shopping for a wide range of products and services – all in one place. Meeting up with old friends and contacts. FREE entry to the Arboretum. Competitions and events, 3ATC Tree Climbing Competition. Off-site camping Friday night, hog roast, pub bar and band. Easy access site. Extensive FREE visitor parking. There is plenty to bring the buyers: whether it is competitions, the tree work and equipment demonstrations from STIHL and other industry leaders, the catering and entertainment, the camping and networking, meeting the AA or SIMPLY the SHOPPING. 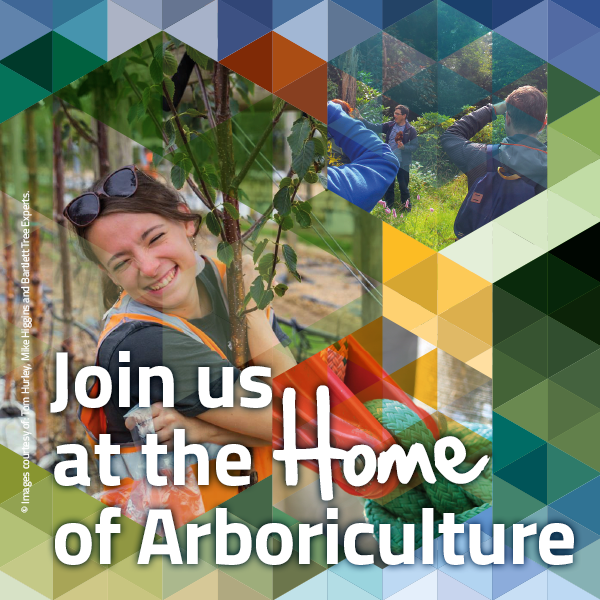 We are sure that at least 8,000 buying arborists will be here again this year. Plus the interest of Westonbirt visitors: The tree loving general public! Are you a regular to the ARB Show? We’d like to welcome you again this year. Booking a space is easy – using the new online booking system! Either pay in full on line by card or request an invoice. (Invoices must be paid within 7 days of booking). Access to the ARB Show is easy – the entrance to Westonbirt Arboretum is on the A344 approximately 3 miles south of Tetbury, Glos, GL8 8QS. Standard plots are 10m x 10m as shown. ‘T’ plots are curtain-fronted marquees, 3m x 3m. The ground surface of all plots is rough mown grass. Prices are indicated by colour coding as detailed in the ‘key to stand prices’, above. Overnight security patrols (Thursday-Friday and Friday-Saturday) are included in these prices, however, the AA does not accept responsibility for any loss or damage to your property. Marquees can be provided on your plot by the Arboricultural Association; please ask for details. D01 – D09 are for active, running machinery demonstration only (no static displays accepted on these plots). No noisy running machinery may be demonstrated on other plots. Wood and brash for processing on demonstration sites is available for purchase, which also includes removal of any arisings after the Show. The Arboricultural Association reserves the right to adjust site layout to reflect demand without notice. Exhibitors will be allocated three wristbands per plot booked, which are valid for both days. Additional staff or guest wristbands may be purchased. Please note that is the responsibility of the Exhibitor to ensure that all their staff and/or guests are provided with wrist bands prior to the event. Entrance gate staff will not permit entry to any staff/guests on show days who are not wearing a wristband.